This Rakshabandhan, we attempt to explore the fundamental principles of the sibling relationship. Raksha Bandhan, the great annual affair where all brothers and sisters set their differences aside and attempt to celebrate their love-hate relationship. With long-awaited family reunions, nostalgic recollections of childhood shenanigans and The Godfather level negotiation regarding presents; a Rakhi is exchanged for gifts, chocolates, or (everyone’s favourite) cold hard cash. The brother-sister relationship is sacred, but it’s witnessed elsewhere too. 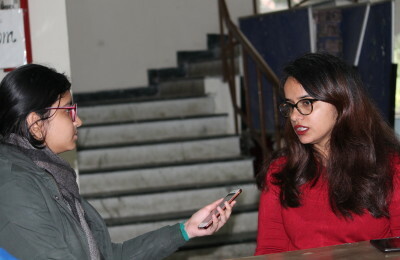 The University of Delhi has a number of all-girls colleges and in there, we see a different dynamic of sibling-like-relationships: sisterhood. These colleges have, time and again, challenged the myth of ‘girl rivalry’. The students of these colleges have moved way past the stereotype of ‘is she smarter than me’ and ‘look at her attitude’’ and transcended to hanging out together in their own girl gangs. These comprise of future CEOs, mothers, defence personnel, artists, and politicians. Their views and ideas may not align, but keeping up with the spirit of sisterhood, they protect one another regardless. The past decade was a little toxic, with women proudly proclaiming themselves as ‘anti-feminists’ and participating in the culture that pitted women against one another. Society had done a horrible thing to womankind by making them believe that they were lesser than men and in order to be acknowledged, they had to compete with other women. However, with increased awareness and the advent of progressive pop culture, be it the feminist t-shirts or snazzy memes, the scenario changed. Girls have each other’s backs. They stand for and protect one another. Be it small things like fixing their hair, shaping bigger ideals that determine their lives, or drafting a perfect text to that one ex, our sisters have got us covered. They address real issues like education, equality, a secure future, and most importantly, self-love on our minds. The state of affairs in my home was always slightly different. Growing up with a single mother, I, and my little sister shared a solicitous bond; I was more of a brother to her than a sister. Although this brotherly sentiment was never symbolically validated with an actual tangible rakhi, it was omnipresent. For her, I was, and still am, a warder of potential ‘boyfriends’ and amateur Batista Bomber. Perhaps the absence of a male figure in her life made me unconsciously morph into one, but in our household, that’s what I am now. Sometimes that absence is more severely felt; while scratching out ‘Father’s Name’ to write my mother’s in every official form filled or trying to deal with the people’s pitiful glances with dignity. Other times, it’s just a matter of being the makeshift electrician, the amateur chauffer, and the destructor of my mother’s favourite mason jars. It has its ups and downs, but the foundation of our relationship remains the same. Dear men, I do not intend to take your thunder away. The celebration of Raksha Bandhan, albeit patriarchal, is fun. This Raksha Bandhan, let’s acknowledge and celebrate brotherhood in all its forms, as at its core brotherhood is a sentiment, a promise of unconditional love and support.